Preheat the oven to 250 degrees and place a sheet pan with a wire rack in the oven. Whisk together the eggs, milk, half and half, vanilla, salt and sugar in a low casserole dish (I use a glass Pyrex pan). Heat a griddle or large non-stick skillet on medium-high heat with one tbsp of butter. Working in batches, place the slices of challah in the custard mixture and let soak for 30 seconds or so, before turning over to soak the other side. Once the butter has melted, place the custard dipped challah in the pan. Grill for about 3 minutes per side, or until golden and firm. 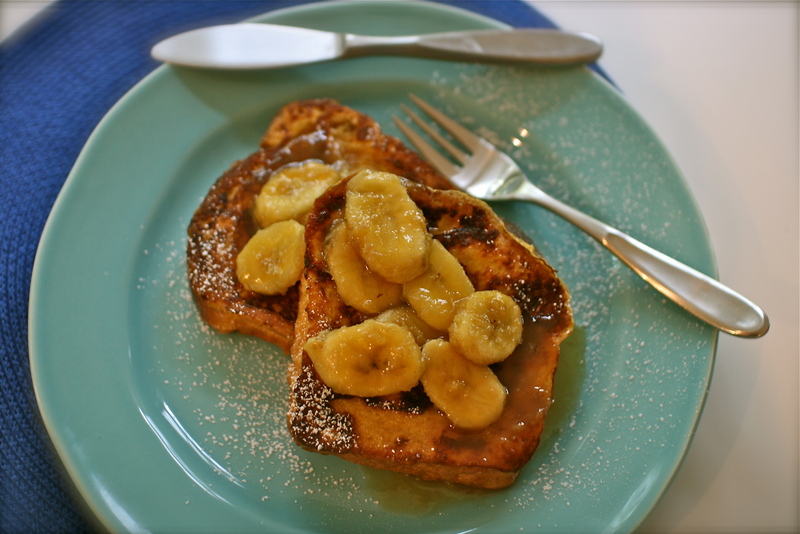 Transfer each finished slice of French toast to the preheated oven to stay warm. Repeat with the remaining challah slices, using the other tbsp of butter as needed. Keep in the warm oven until ready to serve. In a medium size non-stick skillet, melt the butter over medium heat and add the brown sugar and cinnamon. Using a wooden spoon, stir until the sugar has dissolved and combined nicely with the butter. Stir in the banana slices and cook for a few minutes, until the bananas begin to soften. Raise the heat slightly and add the rum. Stir and cook until the rum is heated through. The alcohol will cook off as it simmers. 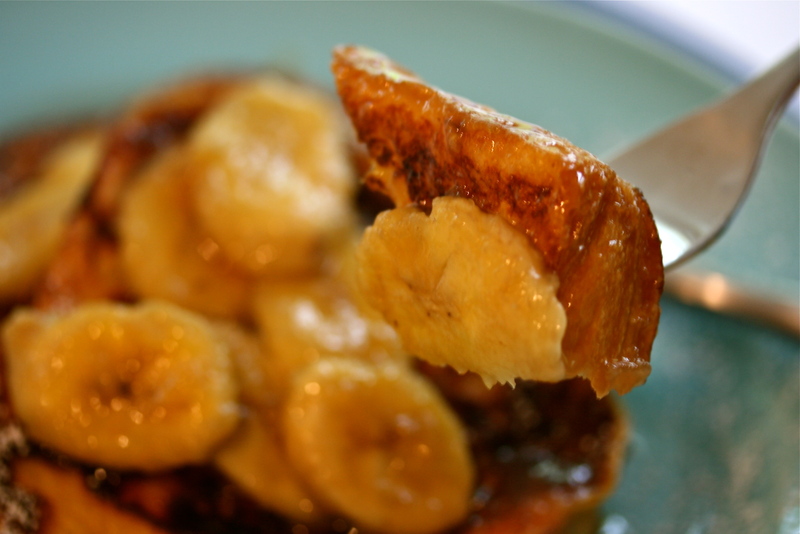 Spoon the Bananas Foster over the French toast slices and sprinkle with a little powdered sugar. Decadent, sinful and yummy! On a side note, a few nights after Alan’s fancy breakfast, I made a second batch of the bananas to tweak the recipe and we had it over vanilla ice cream for dessert. Better than the French toast if you ask me!